18世紀以降タイ北部に移住した山地民に対し、当初不干渉の姿勢を示していたタイ政府は、1950年代以降、山地民の活動に法的な制限を加えるようになる。その結果、山地民自身もまた、自らの伝統的な慣習を、タイの法制度に合わせて変えていくようになった。本論文では、タイ北部の白モン族の伝統的リーダーによる紛争解決の変化を通して、山地民がタイ国の法制度という新しい環境へと自らの紛争処理システムを適応させていった過程を明らかにする。 Highlander people migrated to Thailand after the eighteen century. During initial phases of their movement, Thai Government had adopted a non-interference policy. Since 1950's, Thai government policy toward highlander people has come to control and submit them by Thai legal systems. 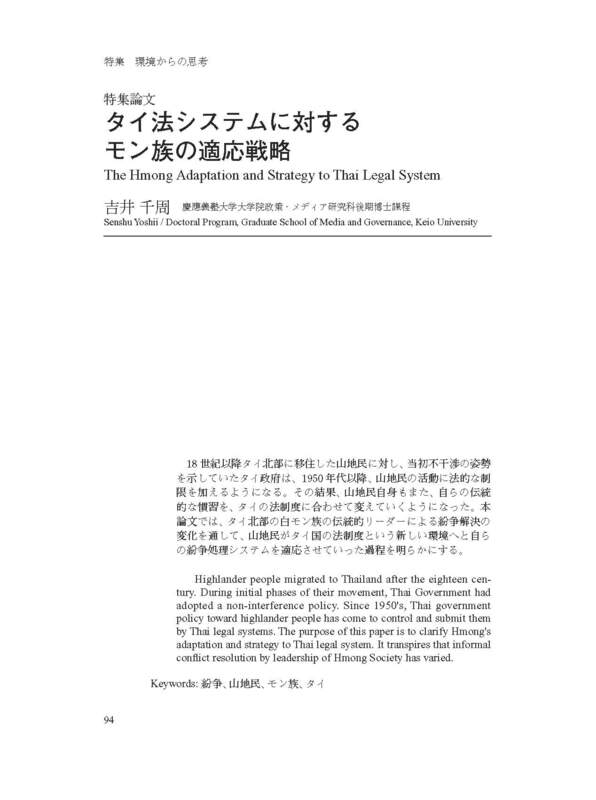 The purpose of this paper is to clarify Hmong's adaptation and strategy to Thai legal system. It transpires that informal conflict resolution by leadership of Hmong Society has varied.